Visit the coolest coffee shops in Bogota to shop the best specialty coffee beans in Colombia – or just linger over perfect espresso, pour over, cold brew, latte, or the mocha of your choice. Brewing methods are unlimited, baristas creative, and coffee beans among the best in the world. Even if you’re not in Colombia in the hunt of coffee, stop by at one of these cafes to sniff out the cool hipster vibes of Bogota. There’s something exciting brewing in Bogota’s coffee shop scene. Tens of hip third-wave coffee shops have been popping up during the last couple of years – and they serve some of the best coffee beans in the world. Just five years back, it was still hard to find a solid cup of specialty coffee in Bogota, or anywhere in Colombia. Although Colombia has ranked among the three biggest coffee producing countries in the world for decades, Colombia’s best coffee beans used to be imported to roasteries around the world. 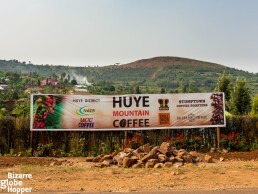 The same story has become a little too familiar to us after touring several coffee nations in the hunt of the best beans, like Nicaragua, Kenya, Tanzania, and some of the upcoming stars such as Uganda and Rwanda. But let’s go back to the bustling streets of Bogota for some serious specialty coffee tasting! First, work your way into trendy Chapinero neighborhood (we preferred taxis in Bogota), which is the unofficial hipster coffee shop mecca in Bogota. We even chose Chapinero as our home base in Bogota and picked our hotel in the middle of the coffee house triangle, which I drafted on Google Maps (I know, my caffeine addiction sounds bad)! All the first four coffee houses were less than a 10-minute walk from our hotel (and from each other), meaning that you can visit all of them conveniently during one morning or afternoon. Just watch out for that caffeine high! 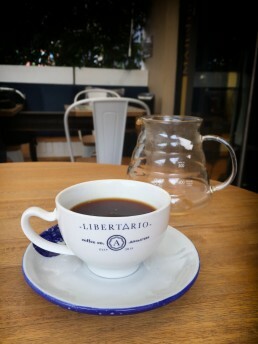 Libertario Coffee won our hearts even before we landed at Bogota. They have an ultramodern and experimental coffee farm called La Palma y El Tucan in Cundinamarca area, just 1,5 hours by car from Bogotá. The passion for specialty coffee vibrates in the air: they call their extremely knowledgeable baristas “barirockstars” and host visiting (famed) baristas from all over the world. 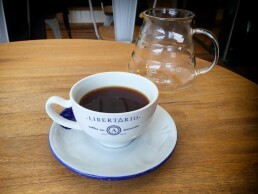 Sampling the rarities of Libertario Coffee (including Geisha and SL28) was one of the highlights of our trip. Libertario Coffee is small, fancy, and yet relaxed coffee shop catering business clientele of Chapinero. We left the cafe with broad smiles on our faces and boxes of praised Geisha beans in our bags. Tip from specialty coffee geek: Libertario’s coffee farm in Cundinamarca welcomes non-trade coffee pilgrims! 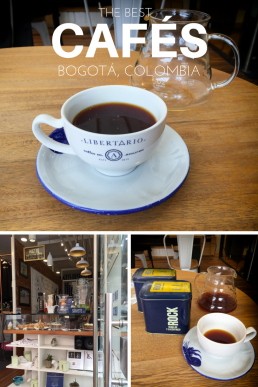 Libertario Café: the best specialty coffee in Bogotá if you ask me! Hipster cafe built in a container with a sunny rooftop terrace and unbeatable coffee beans – what else you could wish! Cafe Cultor is located next to Impact Hub, in the very heart of the entertaining district called Zona G. To make it perfect for coffee tourists, Café Cultor is just a 5-minute walk from both Amor Perfecto and Libertario Coffee. The roots of Café Cultor reflect the past coffee scene of Colombia: Café Cultor started as an export company but decided to open a local coffee shop in Bogota after realizing that majority of their beans were flowing out of the country. Thus, they aim to educate coffee addict on Colombian coffee with infographics and workshops, and (free!) tastings. Coffee is roasted in their own lab. The original container cafe has now three sister coffee shops around Bogota: Café Cultor Librería (Calle 71 #10-47), Biblioteca (Calle 11 #4-14), and Casa (Calle 70A #9-44). Don’t let the location or late 1800’s pharmacy look fool you, inside Hilton Hotel lurks a true gem of Colombian boutique coffee roaster. Actually, they are more than boutique, also serving ”exotic” and ”grand cru” scale coffee beans (rated by Specialty Coffee Association of America). The bizarre fact of the day: 90% of their coffee beans comes from ”the red zones” of Colombia a.k.a guerrilla-infested areas. By supporting Café Devoción, you’ll support farmers in those troubled, hard-to-reach corners of the country. Go there especially for exotic coffee bean souvenirs and cold slow brewed coffee. Café Devoción has a separate roastery in Bogotá. And that’s not all! Café Devoción has a high-end sister café in Brooklyn’s Williamsburg. Prime Colombian coffee beans are shipped to New York within 10 days of harvesting. I’d call that true devotion (devoción)! Ps. Café Devoción has a webshop shipping the freshest possible Colombian coffee within the US. Amor Perfecto is the first specialty coffee roaster in Colombia, established already in 1997. Their single-origin coffee is available in 600 locations around the country, from supermarkets to other cafes. While we didn’t have time to visit their café, we had the chance to taste their beans. A 15-minute hike from cafes listed above, Bourbon Coffee Roasters hides near the TransMilenio station of Chapinero. So if you use buses, it’s probably on your way. Single origin Colombian coffee beans are roasted on the spot. The newest addition to the third-wave coffee shops of Chapinero, Varietale is already a local favorite. Locally roasted single origin done with your fvorite brewing method. Azahar Cafe is your trusted supplier of specialty coffee in upscale Parque 93 neighborhood. Plenty of brewing methods available together with single origin Colombian coffee and blends. The original Parque 93 Azahar Cafe has now two sisters around Bogota: one in Candelaria (Carrera 3 No. 12B-60) and the other in San Felipe (Calle 74 No 22-91). Trust Cafe Origami in your caffeine needs in trendy La Macarena neighborhood. As the name suggests, origamis are the theme here. Contraste Coffee Lab is your best bet in the historic old town of Bogota called Candelaria. It’s centrally located nearby Museo d’Oro. The owner roasts coffee on spot. Brewing and tasting classes are available. Arrive at Colombia in style: pop in Juan Valdéz Café right at the airport! It will be the best cup you can find at the El Dorado International Airport for sure. Geek it up and order chocolate-flavored beans from Sierra Nevada mountains, brewed imposingly at your table with Siphon. In my opinion, that’s the best cup you can get from Juan Valdez, assuming that the barista is skilled. While not our favorite, Juan Valdez Café is a Colombian coffee icon. The multinational coffee chain has cafés all around the country, quenching your thirst of coffee conveniently almost anywhere you roam. 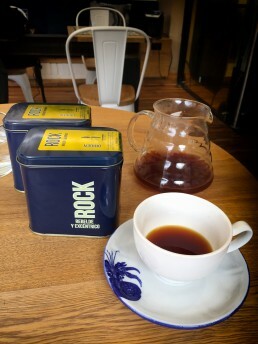 You might have heard of the brand, as they even have own café shops for example in the US, Spain, Mexico, and several other countries, mainly in South and Central America. One word of warning, though. I’d call Juan Valdez a mainstream version of specialty coffee shop, with chain-like atmosphere and average coffee beans but a variety of brewing methods (though the selection of both beans and brewing methods varies between the cafes). The quality between baristas and thus our cups varied tremendously during our one-month tour in Colombia (both within one cafe and between branches). Still, Juan Valdez is always a decent choice for a quick espresso fix, if there aren’t independent specialty coffee shops around. Juan Valdez claims to be the only internationally recognized coffee brand that belongs to coffee growers. It was established in 2002 by a non-profit, National Federation of Coffee Growers. A fictional character named Juan Valdez illustrates their cups and merchandises with his mule – fun souvenir options for coffee lovers among your friends or family. Join the discussion! We had a limited time to roam the specialty coffee scene in Bogota, so what are your favorite cafes and why? Yesss a fellow third wave coffee snob! I was thrilled with the availability of specialty coffee in Colombia. We went to about half of these in Bogota. Medellin also has incredibly good coffee! 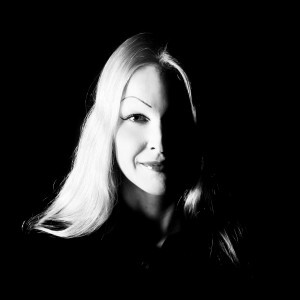 Hi Lia, pleased to meet you! Yes, I absolutely loved Pergamino in Medellín 🙂 I ended up writing another coffee-infused piece today – stay tuned for our favs from Cartagena. Had too many cups during the afternoon, probably! Nice post! 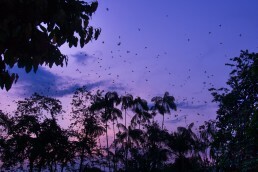 I never been to Colombia but I hope to visit it one day. I am more a tea drinker than a coffee lover but this is helpful information. And beautiful pictures. Thanks for sharing! Wonderful list!! I always stay up later than I would like when I drink coffee but I can’t help myself! Can you believe I hate coffee? haha I really like the smell of it, but the taste.. not really. 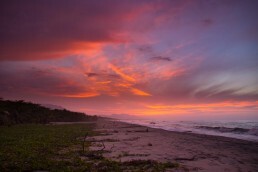 Colombia is very famous for its coffee and if you like the drink, it is a must to try a few when in the country, right? I think I would like to go to these places even just to get a bit of the atmosphere 🙂 thanks for sharing! Hi Hannah! So great that you found great coffee from Cartagena! I absolutely loved tiny Café San Alberto inside the old town, I’m thinking about posting another piece about them in the upcoming weeks. 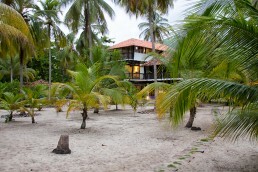 Going to check out your blog – what a lovely photo from Tayrona National Park! Hello everybody, thanks for reading! Lisa, I still regret not bringing those JVC cups with us 🙂 Alina, Colombians love their “tinto” (black coffee sold on the streets), but for decades the best coffee beans were exported. Luckily, things are changing! 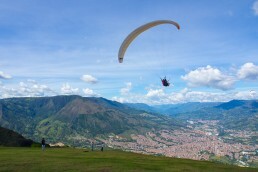 I’ll have to stop into some of these when I go to Colombia! Beautiful pictures and helpful information. Thanks for sharing!